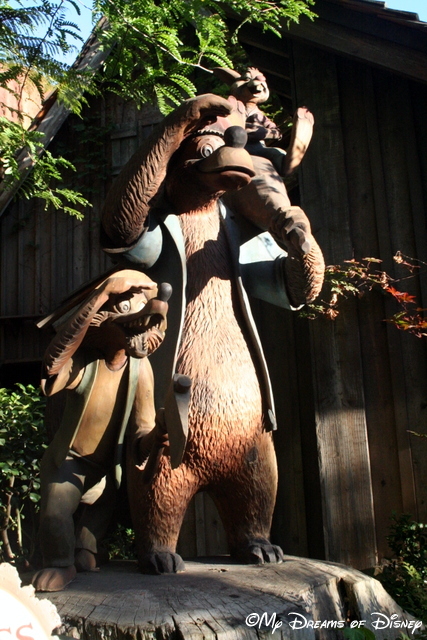 #DisneyTrivia – More Winnie the Pooh! The Many Adventures of Winnie the Pooh! Hello everyone, and welcome to today’s #DisneyTrivia post. 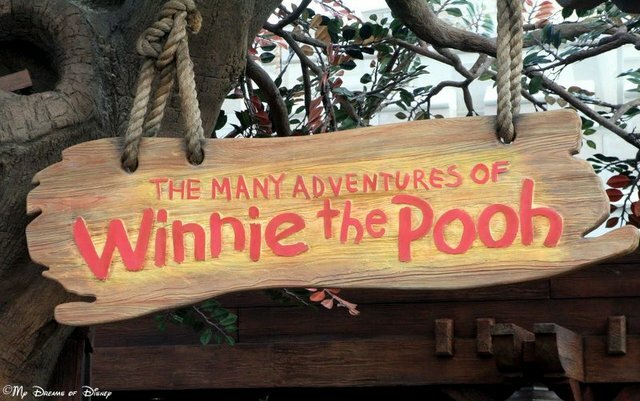 As has become our standard during our #DisneyWorldCountdown, today we are continuing our look at the Many Adventures of Winnie the Pooh with some interesting facts and figures about the attraction! I’d first like to welcome my friends Jodi from Magical Mouse Schoolhouse and Heidi from Heidi’s Head tonight! Our friend Jenn from Disney Babies Blog has had to temporarily step down due to scheduling conflicts, but we look forward to her return in the near future! 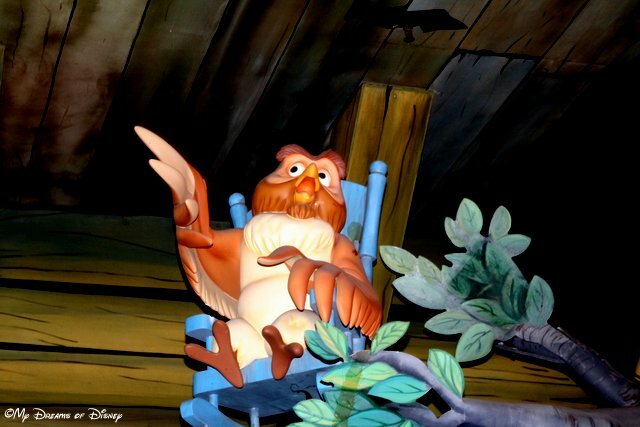 The Many Adventures of Winnie the Pooh opened on June 4, 1999, as a replacement to Mr. Toad’s Wild Ride…there are many people that are still upset by this decision! 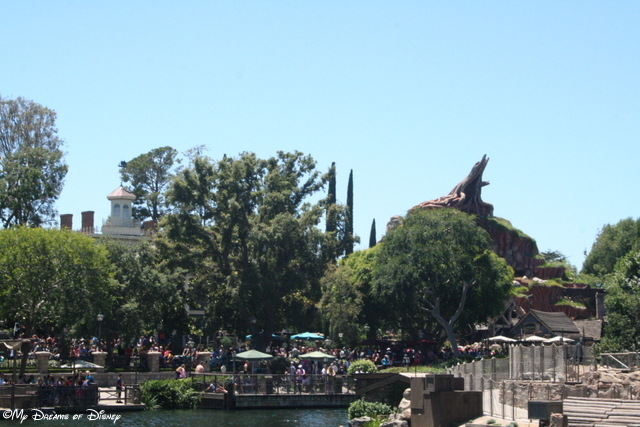 Pooh’s Tree had to be moved as part of the Fantasyland expansion. The tree, which weighs 120 tons, and to move it required 3 nights of work involving one of the largest mobile hydraulic cranes in the construction industry to move it. The crane actually had to be taken apart and put back together in order to make it across a bridge! Each “Hunny Pot” holds four guests, and up to 12 “Hunny Pots” can be on the track at one time! The ride length is 3 minutes. If you want to watch a video of the move of the tree from the Disney Parks Blog, here it is! #Day55: The Many Adventures of Winnie the Pooh! Hello everyone, and welcome to today’s post for our #DisneyWorldCountdown series! We are now at #Day55 in our countdown, almost halfway completed, and today’s post is about the Many Adventures of Winnie the Pooh! 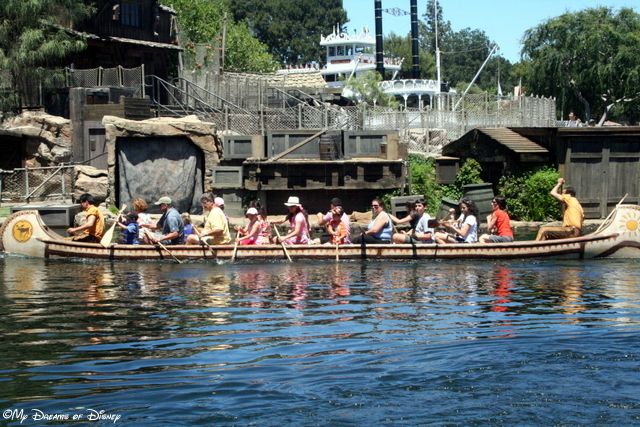 This attraction is located in Fantasyland, and also exists in Disneyland at Critter Country. The Magic Kingdom version has a new interactive queue that allows your younger kids to play in Pooh’s tree, as well as look for different things in special honey displays, and other fun things for the kids. At this point, I would guess that Sophie has outgrown the interactive queue part of this, but we still enjoy taking a ride into the Hundred Acre Wood from time to time! Sophie about to embark on her journey to the Hundred Acre Wood! The picture of Sophie above is an older one — she was only 5 or 6 in this photo, and still had quite the baby face! The honeypots that we ride in, though, haven’t changed at all to my knowledge, and one game we like to play is to see if we can guess what color honeypot we will get! Owl’s tree has fallen down, but that doesn’t stop Owl from telling his story! The ride focuses on the part of the story where they celebrate a Happy Windsday! The wind was blowing so hard that Owl’s tree fell over, and the rain fell and fell and fell, and — well, you know the story I’m sure! The ride is quite nice when you are visiting the Magic Kingdom during a hot summer day and want to cool down, that’s for sure! Even though we’ve kind of outgrown this, I still enjoy this ride. It’s a fun little trip down memory lane, and when you’re at Disney, that’s really what it’s all about, isn’t it? Do you like this ride? Let me know in the comments if you do and what your favorite part of the ride is, and thanks for stopping by! My wife Cindy put it perfectly — this picture of Sophie and her BFF Riley is Walt’s vision in a nutshell. Hello everyone, and welcome back to another of our favorite Disney memories series! 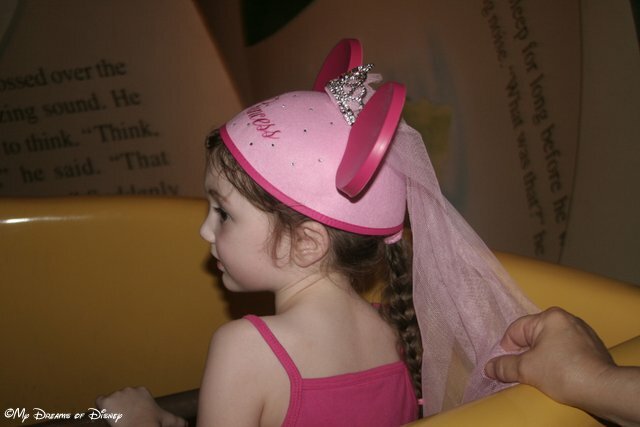 This time, we are taking a look at Disney memories 2008, which was our second straight year staying at Coronado Springs, and also the first time we had ever brought Sophie to Walt Disney World for her birthday. The memories from that trip are still strong, and I love taking a look back at them — it’s almost like I’m there right now! The picture at the top of the post is Sophie and her BFF Riley, who we invited to spend the day with us to celebrate Sophie’s birthday. This was actually on Sophie’s birthday, and the picture was taken in the queue for The Many Adventures of Winnie the Pooh. Riley’s family was visiting their family, so her mom ran her over and we had fun for the day. It was a great day because Sophie and Riley, who are just four months difference in age, have been best friends since before they were born. For all three of us, our favorite memories stem from this day. It’s not that the rest of the trip was no good, but it’s not every day that you get the opportunity to be at Walt Disney World for your 7th birthday on your actual birthday with your best friend, so the memories we have from that day are incredible. We stayed over at the Magic Kingdom on this day in part because we were eating dinner there, but also because it is their favorite park, so it makes perfect sense. 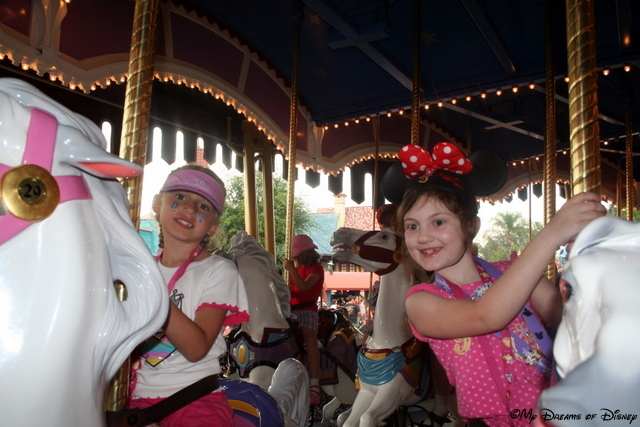 We rode the Caroussel, we saw Mickey’s PhilharMagic, we rode it’s a small world, and we went to Liberty Square. We did a lot of things I don’t even have pictures of, but one thing I know we did was had fun. 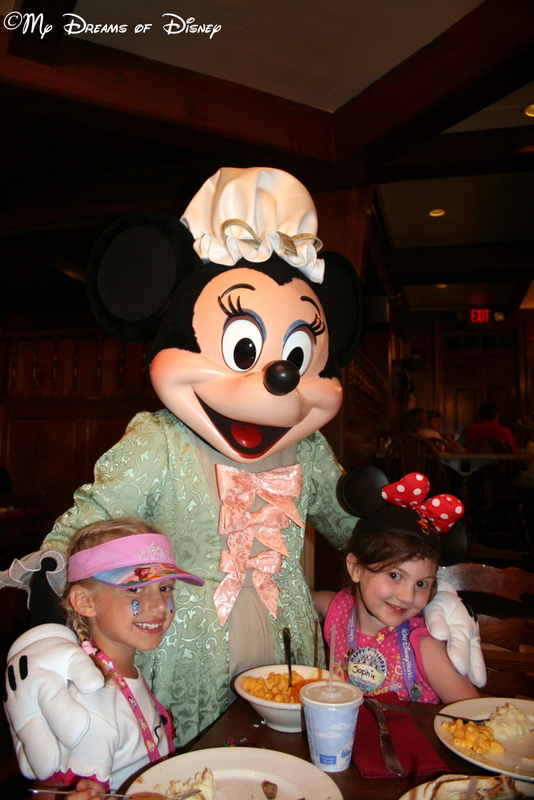 Sophie and Riley posing with Minnie Mouse at the Liberty Tree Tavern. As you can see, we ate dinner for Sophie’s birthday at the Liberty Tree Tavern, back in the days when it was a character dinner meal. For this night, Minnie Mouse, Chip and Dale, and Goofy came by to see us, and the girls loved seeing them all. I’ve always had a soft spot for Minnie — just ask Cindy — so I miss that they don’t have this as a character dining location anymore. For all of us, our favorite part of this trip was having Riley spend the day with Sophie at the park — best friends, just enjoying themselves at our favorite vacation destination. 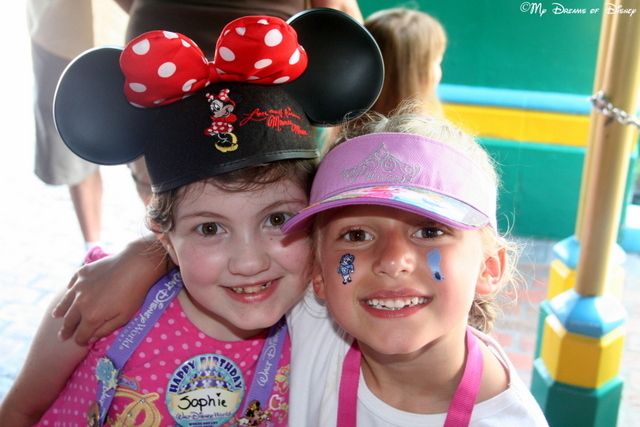 I can’t wait until this summer, when these two friends — and another new friend — are reunited for Sophie’s 13th birthday! Sophie and her BFF Riley, on Sophie’s Birthday, June 19, 2008. Hello everyone, and welcome to this week’s edition of the Wordless Wednesday Blog Hop, hosted by my great friend Deb from Focused on the Magic! This week we are talking about our June Calendar Shot, and since my daughter Sophie’s birthday is in June, what better subject to feature then her?! The picture above was taken in the queue for the Many Adventures of Winnie the Pooh line on the day that we celebrated Sophie’s 7th birthday with her friend Riley. We had such a great time that day! We went to the Magic Kingdom for the day, we did some swimming at our pool at Coronado Springs, and we came back to the park for dinner at the Liberty Tree Tavern, where I got this photo. Sophie and Riley with Minnie Mouse! I hope you have enjoyed the photos I’m sharing with you — now, please click on the button to go to Focused on the Magic to see the rest of the entries! Thanks, and make it a Disney day!